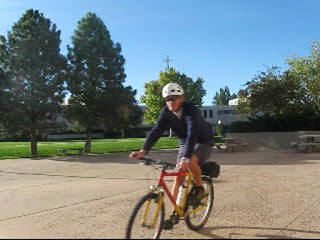 When I was up on the north-side last week, I decided to take a cruise through the University to see if I could spot any student bicycle commuters. I didn't find any, but I did see Ed, who is a chef at the University and has been riding his bicycle to work almost every single day for the past 7 months. Now we just need to student body to show the same initiative and dedication!